Fast video cataloger supports several ways of finding your video or scene inside a huge collection. Most of the technique is based on adding relevant metadata like keywords, actors, descriptions, rating etc. For some situations you will find the visual search to be the most efficient. It is enabled through the automatic indexing with multiple thumbnails per video. You will then have an exceptionally clear visual overview via the Video scenes for each video when you browse through your videos. Picture yourself searching through 30 clips of 25 minutes each in search for all scenes that includes certain characters. 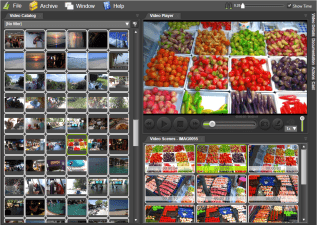 With the visual search capabilities of Fast Video Cataloger you can be done within minutes. When you search for scenes you get results showing specific scenes with the given keyword. You can easily jump back to the complete video, or play each scene right from that time. 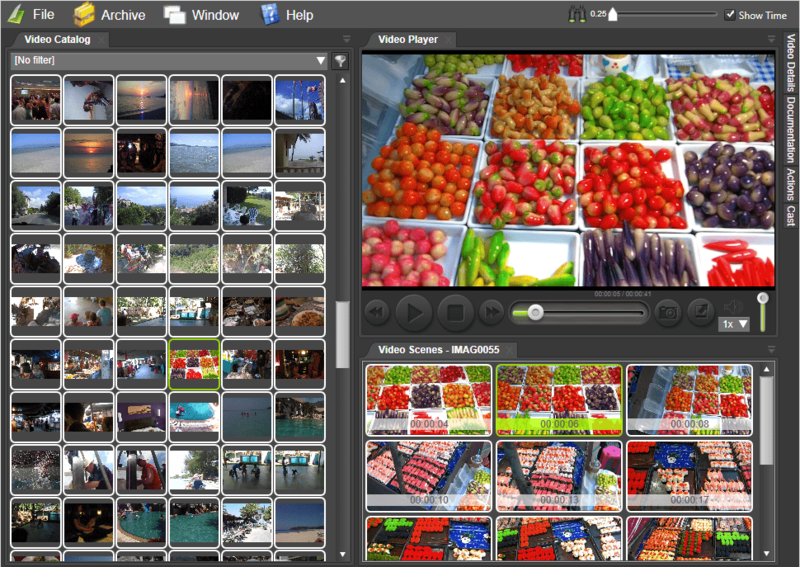 Finding videos you are looking is now easy; it is one of the strong points in Fast Video Cataloger. Via the Filter drop down tool you get your videos displayed based on your own keywords, added actors, genre, rating, filename, title, description, file path or associated link. Sorting your video list is done through clicking the headlines like ID number, Length, Title, file path and Added date. You can write your own description, as free form text, for every video. Depending on what types of videos you have in your catalog this could be a description, working notes or whatever suits you. The description field can also be searched enabling you huge freedom in your way of collaborating with others and structuring your work. Actors can be assigned to videos and searched. Actors can be real actors in a video but that is not all. Actors are really a special powerful type of tag you can assign to a video. An actor can in itself have its own tags, a portrait image, name and description. The obvious use of actors is to use for real actors in a video but other uses can be for customers, props in scenes, cameras used for recording and so on.